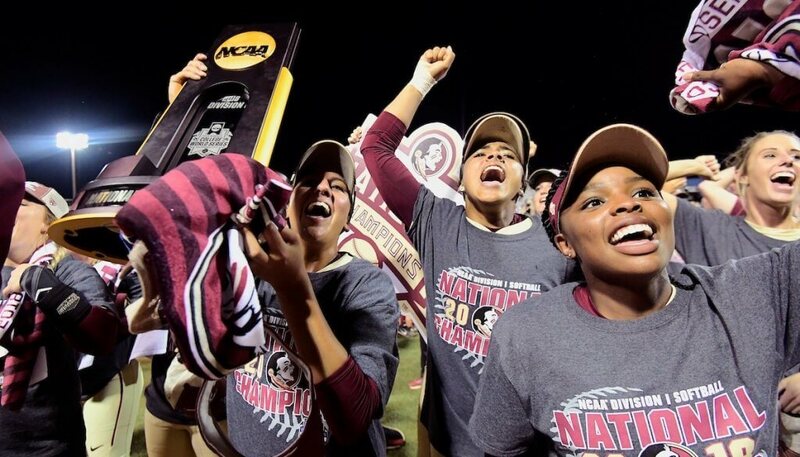 Florida State players celebrate the Women's College World Series title win on June 5, 2018. Photo: NCAA.com. Florida State, coming off its first NCAA National Championship, is the preseason favorite in the 2019 USA Today/NFCA Division I Top 25 Coaches Poll. The defending champs collected 21 of a possible 32 first-place votes and 780 points. The Seminoles (61-9) swept preseason No. 3 Washington, becoming just the third team in NCAA history to lose its first game and come back through the loser’s bracket to win a title. FSU had to win six straight postseason elimination games just to make the Championship Series. WCWS semifinalist UCLA picked up six first-place votes and 756 points to come in at preseason No. 2. The Bruins (58-7) have reached the WCWS the past four seasons and are the first of three Pac-12 programs in the top-10. National runner-up Washington follows their league rivals at No. 3. The Huskies (52-10), who collected five first-place votes and 742 points, won their first eight games of the postseason before falling to the Seminoles in the Championship Series. 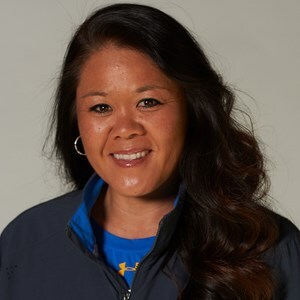 Kelly Inouye-Perez has won seven titles at UCLA as a player, assistant and head coach. The Bruins are #2 in the preseason poll. Oklahoma, the other 2018 WCWS semifinalist, is ranked fourth with 696 points. The Sooners are the Big 12’s preseason favorites and have swept the regular season and tournament titles the last two seasons. No. 5 Florida (604), the Southeastern Conference’s preseason No. 1, starts a run of six SEC programs ranked over the next seven spots. The league has a total of 11 institutions in this year’s top 25. Georgia (604) comes in at No. 6, while No. 8 Tennessee (571), t-No. 9 Alabama (453), t-No. 9 South Carolina 453) and No. 11 LSU (446) fill the six through 11 positions. Arizona (571) enters 2019 ranked No. 7. Along with the six programs in the top-11, the SEC is represented by No. 13 Kentucky, No. 14 Arkansas, No. 17 Auburn, No. 20 Texas A&M and No. 24 Mississippi State. The Pac-12 followed the SEC with five programs. UCLA, Washington and Arizona are joined by No. 12 Arizona State and No. 25 Oregon. The Big 12 had four institutions in the poll, Oklahoma, No. 16 Texas, No. 18 Baylor and No. 22 Oklahoma State. No. 19 Michigan and No. 21 Minnesota represented the Big Ten, while the Atlantic Coast Conference, Sun Belt Conference and Colonial Athletic Association each had one program ranked- top-ranked Florida State, No. 15 Louisiana and No. 23 James Madison, respectively. The 2019 USA Today/NFCA Division I Top 25 Poll is voted on by 32 NCAA Division I head coaches, one representing each conference. The first regular season poll will be published on Feb. 12. Receiving Votes: Long Beach State (69), Notre Dame (40), Liberty (30), Texas State (23), Northwestern (22), Ohio State (15), Hofstra (15), Cal State Fullerton (13), Drake (12), California (10), Missouri (9), Florida Gulf Coast (7), Oregon State (7), Boise State (4), McNeese State (3), Wichita State (2), Tulsa (1), Houston (1), Longwood (1), Ole Miss (1), USF (1). The 2019 USA Today / NFCA Division I Top 25 Coaches Poll is voted on by 32 NCAA Division I head coaches with one representing each of the NCAA’s Division I Conferences.